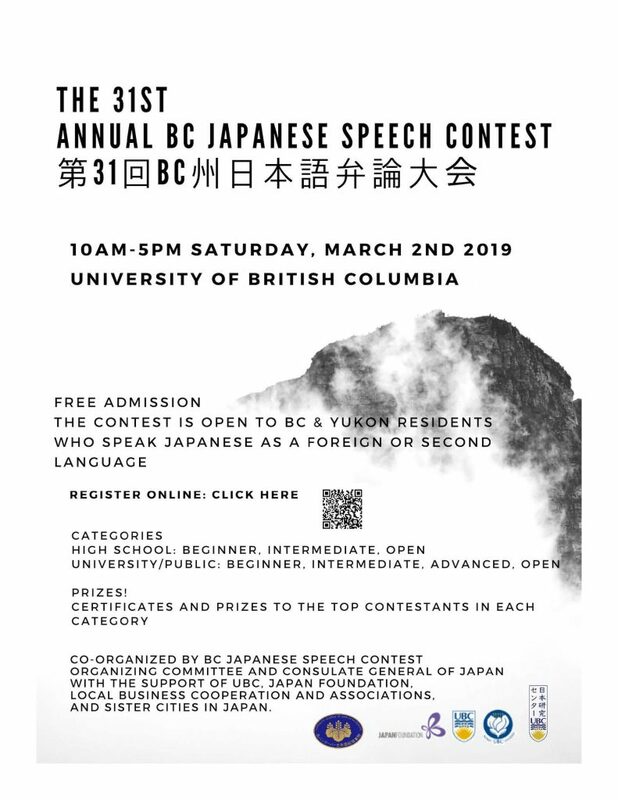 The Annual British Columbia Japanese Speech Contest is open to British Columbia and Yukon residents who speak Japanese as a foreign or second language. The 2019 Contest will be held on Saturday, March 2, 2019 at the University of British Columbia (venue: TBA). The High School Division is tentatively scheduled to start at 10:00 am and the University/Open Division at 1:00 pm. The finalized schedule will be published on Monday, February 18, 2019 on the Consulate General of Japan’s website. Read the 2019 contest guidelines. Register via the online application form. Deadline to apply is Monday, February 4th, 2019 at 5pm.